I finally got one. It is an entry level bike that was $1000 all in. For that price I feel like I got lots of good stuff. Alu frame and fork (expected at this price), Shimano hydraulic discs, Deore Shifter and Derailleur, 1X10 drivetrain, cheap 4" tires, no-name cranks and chainring, braze-ons for mounting racks and fenders. Of course, no self-respecting bike nut could just leave such a blank canvas alone. Thanks to my age and my stroke and resulting balance issues, I have no demands for a high performance machine suited to difficult trails, rocks or crazy climbs. I do, however, want to ride on icy and snowy bike paths right through the winter. I plan to turn this thing into a tank of a winter commuter with a rear rack and full fenders, high-end fast-rolling (or at least faster rolling) tires, and lots of studs just for overkill. It will be a thing of great and clownishly capable beauty. I will, of course, put it on display here when I'm done. I've barely ridden it, but I did try it out on varied terrain today. 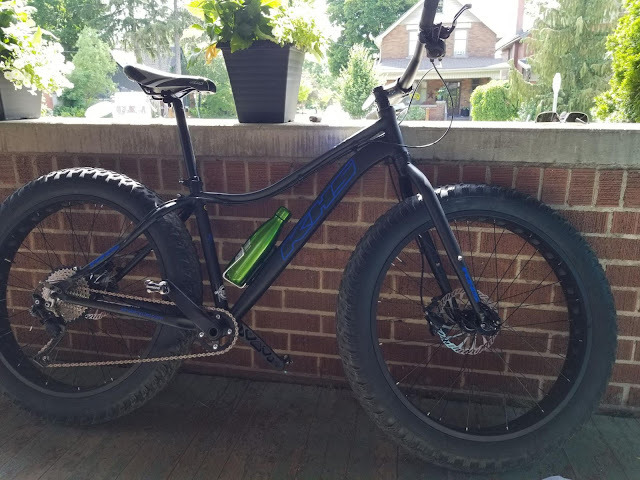 I thought I would like a fat bike, but honestly I was not prepared for how fun this thing is. It, and I, are slow. Thing is, it doesn't matter. It feels wonderful, just begging you to ride over more and different stuff the whole time. When conditions do favour going faster, it is insanely solid and stable while the treads growl on the pavement. You neither steer it nor lean it too much, but rather "guide" it in a way that is very difficult to describe. Those big tires have a will of their own once they're spinning, but you learn to work with it rather than against it... it is a weird and satisfying experience. I've got a really good feeling about this. This is a win/win. Fun for you, and solid entertainment value for your readers. Go crazy, and take us along for the ride. Yee Haw! I've been eyeballing fat bikes also for winter commuting. Surely, I tell myself, I can ride snow, sleet or hail...if I only had a fat bike. Funny what we convince ourselves that we need to buy another bike! I bought a folding bike last fall - don't need, but love. I'm sure a fat bike would be the same. I will live vicariously through your build. Good on you for getting one! Thanks Pondero and Annie! As you know I've been riding in winter for a long time. A regular MTB with studded tires, or even my setup last year with "skinny" 32c studded can handle almost all winter conditions, including icy streets. This thing, however, should be able to handle icy TRAILS, with their bumpy/dimpled ice that I couldn't manage on previous bikes. As such, it could move my winter commute off the street much of the time, offering the serenity I enjoy in other seasons in winter. if it isn't too difficult, it will be SO good.